If you’ve been wondering how everyone lived in Storybrooke for 28 years without even noticing the time pass, this week’s episode, “Welcome to Storybrooke,” takes us back to where the curse began. In previous episodes we’ve seen the curse take over Fairytale Land, but until now we hadn’t seen how the town of Storybrooke came about. I thought it was fun to see Regina (Lana Parrilla) as we first met her, when she was satisfied that she had beaten Snow White (Ginnifer Goodwin) through the curse and she ruled the town unquestioned. I thought the flashback sequences to 1983 Storybrooke were more interesting than the present day stuff with a moping Snow, though we finally get to find out the identity of the mysterious stranger from the car accident. It appears the people of Storybrooke have been living in a continuous Groundhog Day loop for the past 28 years. Every day is basically the same, but just a little bit different. The people wear different clothes and say slightly different things when they run into each other. In 1983 when the curse took place in the real world, Storybrooke appeared out of nowhere, much to the surprise of a father and his young son who were camping in the woods nearby. With their car damaged, the pair is stuck in Storybrooke for a while. Regina takes a liking to Kurt (John Pyper-Ferguson), the father, and his son Owen (Benjamin Stockham). 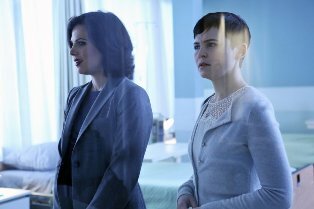 While Regina enjoys her power, she isn’t satisfied with the artificial respect the curse brought. The townspeople only acknowledge her because the curse programmed them to be that way. She forms a real relationship with Kurt and Owen, becoming so attached she tries to force them to stay. She doesn’t understand that she can’t force things to be the way she wants them. It’s a lesson that keeps being thrown at her, but she won’t accept it. In the present time she tries to concoct a potion that will make Henry (Jared S. Gilmore) “think he loves” her. The caveat, besides the falseness of it, is that the potion will require her to kill Snow. Regina wants vengeance and he wants Henry. She’s convinced she can have it all, no matter how she has to get it. I like that Regina is teetering back and forth between power and redemption. One minute she’s ready to kill Snow and the next she’s willing to give it all up for the sake of Henry. It’s hard to tell what direction she will go at any moment. What I didn’t like as much was Snow’s reaction. She spent nearly the entire episode wallowing in bed because she couldn’t stand what she had done. Part of it is I have a hard time seeing what Snow did as being bad. Killing Cora (Barbara Hershey) seemed like at a matter of self-defense to me. Yes, she was saving the life of Mr. Gold (Robert Carlyle), who maybe didn’t deserve her help, but she was ultimately saving everyone. Cora wanted the power of the Dark One, and that wouldn’t have been good for anyone. Nonetheless, I got the feeling we were supposed to feel that Snow had crossed to “the dark side.” This was shown quite literally as a dark spot on her heart. We could see it when Regina ripped Snow’s heart out of her chest, only to shove it back in when she realized Snow was already on a path of suffering. I just had trouble feeling all that sorry for her. A couple of questions linger for me on this episode. One is a continuity issue. 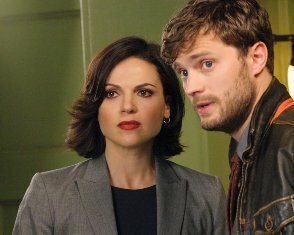 In this episode, Regina visits Mr. Gold in his new shop and tells him this was not the deal they made. She is talking about the fact that no one really respects her. He seems to know what she’s talking about, implying that he knows he is Rumplestiltskin, and she knows that he knows. The problem is that in season one, she is not sure that he knows who he is, and she questions him about it. I wonder if that will be explained, or if it’s just a point that was changed for the sake of the story. The big question left by the episode is what happened to Owen’s father? After Regina realizes Owen is unhappy being forced to stay with her, she lets him go. However, she doesn’t let the father go. I’m not sure why, but he is kept in the back of Sheriff Graham’s (Jamie Dornan – back for the 1983 flashbacks) police car. I’m not sure why she didn’t let him go too. Little Owen runs away, and his father is stuck in Storybrooke. It’s also revealed there is some kind of force field that hides Storybrooke from the rest of the world. So guess who the mysterious stranger is? It’s Owen. He’s all grown up and he’s still looking for his father. I wonder what Regina did with him? This week was a nail biter! Why did they get rid of Neal??? Both Neal and Emma confessed their love to each other and Neal fell though a portal again. I can’t wait to see how they save Storybrooke.